The Beatle’s new American songbook tribute – to be featured in a free iTunes concert Thursday – exceeds the standard standards album. 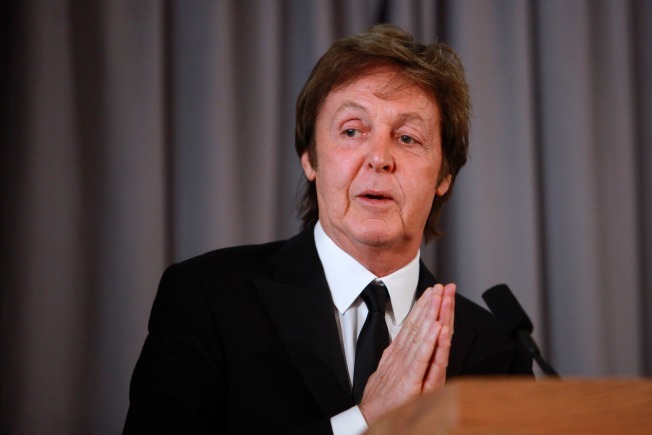 Paul McCartney goes old school on his latest album. During the Beatles’ final, turbulent years, John Lennon sometimes would refer derisively to classic McCartney confections like "When I'm 64" and "Maxwell's Silver Hammer" as "Paul's granny music." But the band members clearly absorbed "granny music" in their pre-Elvis childhoods, with influences from the Tin Pan Alley pop tunes played and sung in their Liverpool homes in the 1940s and 1950s later showing up in finely crafted love songs, from Lennon's "In My Life" to George Harrison's "Something." McCartney, who remembers listening to his father Jim play the tunes of the day on the piano, brings that long and winding road, if not full circle, then to a whimsical figure 8 loop in perhaps his most unique album yet, "Kisses on the Bottom." The collection, which dips into the American songbook, runs the risk of being dismissed as an imitation of Rod Stewart's recent efforts. But "Kisses" – which McCartney is set to promote Thursday night with a free concert streaming on iTunes – is not your standard album of standards. The increasingly adventurous McCartney, with the aid of veteran producer Tommy LiPuma, smartly mixes the obscure ("My Very Good Friend The Milkman"), with the obvious ("Always") and the in-between ("More I Cannot Wish You" from "Guys and Dolls"). Irving Berlin’s "Always," a song that rivals "Yesterday" in the number of cover versions it's inspired, is a standout, as is "More I Cannot Wish You." McCartney, a father of four daughters ranging from ages 8 (Beatrice, his child with Heather Mills) to 49 (Heather, his first wife Linda's daughter whom he adopted) brings a winsome paternal affection we've never heard in his voice to the Frank Loesser tune about a man who hopes the girl he raised will find her own true love. McCartney largely shines amid the stripped-down arrangements featuring jazz pianist and singer Diana Krall. The voice gave us “Helter Skelter” and “Oh, Darling” doesn’t convey age (he turns 70 in June) as much as gentle wisdom and hard-earned experience. If we have a quibble, it's that his singing, in some spots, is bit restrained as if he's trying too hard to be respectful to his fellow songwriters. The juxtaposition between the covers and the two songs McCartney penned for the album is slightly jarring. He sings with confidence and authority on "My Valentine," a haunting tune with an elegant guitar solo by Eric Clapton – a song that wouldn’t have been out of place on his brilliant 2005 “Chaos and Creation in the Backyard.” McCartney effectively channels 1960s Frank Sinatra and Tony Bennett on “Only Our Hearts,” which benefits from a winning Stevie Wonder harmonica solo. McCartney also offers a maturely mellow rendition of “Bye Bye Blackbird,” a tune covered in a far more buoyant fashion on 1970’s “Sentimental Journey,” Ringo Starr’s first solo album, filled with old-school songs his mum loved. Some four decades later, McCartney’s own sentimental journey is a trip worth joining.